On Wednesday the Atlanta Public School Budget Commission tentatively approved a $685.2 million FY16 Budget on an 8-1 vote. The Commission considered raising property taxes to fund a $700.8 million budget – which included the full list of expenditures considered – but then reached a consensus to accept an increase in funding for additional classroom and programmatic expenditures and for implementing additional positive behavior support programs. Revenues are projected to be $682.8 million and the remaining $2.4 million deficit will be funded out of General Fund reserves. The Board will formally act on the proposal in a Special Meeting scheduled for Monday, April 20 at 6 p.m.
Byron Amos voted against the $685.2 million budget and indicated that he was in favor of raising property taxes to fund the full $700.8 million budget which funded most of the priorities considered by the Board over the course of its deliberations. The Commission participants (all Board members were in attendance) appeared to be generally in favor of funding all the priorities that had been identified. However, they were constrained from doing so as the $14 million Beltline payment from the City of Atlanta remains in dispute and the timing of collecting the moneys remains unknown. The Commission included the $14 million payment in the revenues, but believed it needed to maintain an adequate level of General Fund reserves to cover expenditures in the event the Beltline payment was not received in FY16. Under the Board’s policies, the General Fund reserve must be maintained at no less than 7.5% of expenditures. 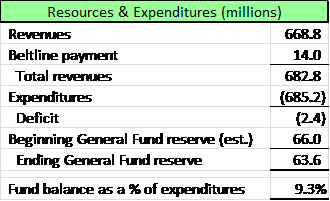 At the beginning of the budget deliberations, the Board established a $668.8 million expenditure baseline and then considered other funding sources to increase the expenditure total. Among the items considered were raising property taxes by one millage point ($18.0 million), using additional General Fund reserves (up to $12.2 million) and including the $14.0 million Beltline payment. As noted above, only the latter was adopted. $9.1 million for school flexibility. This expenditure added back teaching resources that had initially been cut. The amount has been allocated to each school in APS and the principals have the flexibility to direct the allocated expenditure in a manner that they believe will best impact their school. $5.0 million for additional cluster flexibility. This amount will be added to the $9.1 million noted above and can be used by the principals to fund additional teaching resources or the cost of programmatic changes. $1.3 million for “Positive Behavior Supports. The this line item includes expenditures for positive behavior supports (see BOE presentation on this topic here) and includes social and emotional learning implementation, screeners and dashboard information. While the Commission accepted the items above, other identified priorities costing approximately $15.6 million were deferred due to lack of funding sources. The deferred items included $7.6 million for enhancing the educational environment, $0.9 million for additional cluster flexibility, $1.5 million for incremental bus maintenance, $1.0 million for Pre-K compensation parity adjustments, $1.0 million for college readiness programs, $1.0 million for career readiness programs, $300 thousand for the transition to the charter system operating model and $2.3 million in additional funding for the District’s charter schools. It would not surprise me if the Administration reviewed the current budget allocations and made additional changes that might ultimately fund some of the unfunded items noted above. In prior years, the budget process had often been contentious and full of mistrust between the Board and the Administration. This year it has been very different. Budget Commission Chair Westmoreland and Superintendent Carstarphen led a very open and thorough process of identifying the District’s needs, establishing priorities and then funding what it could within the constraint of limited resources. This entry was posted on Friday, April 17th, 2015 at 5:52 AM and is filed under APS Board Meetings, APS Budget. You can follow any responses to this entry through the RSS 2.0 feed. You can leave a response, or trackback from your own site. Meria and Matt have been completely transparent and open to suggestions. It’s so refreshing to be able to communicate with them and actually get responses. I am a elementary foreign language teacher in APS, and we have had some major program concerns that we voiced to Dr. C. She has responded with equal concern, and our concerns have been addressed. Not only that, but her responses back to us have come from HER directly. She is transforming the District by putting the SCHOOLS first. Imagine THAT! While I am happy with the outcome of the night’s work on the budget on Wednesday, I was disappointed that they held the meeting in a room where it could not be livestreamed and/or available later on video. This Board has videoed and showed such meetings previously, and it makes for a much more transparent process. Of all meetings, THIS was the one that needed to be aired – and Board members had an expectation that people would be watching. Given the Board’s new policies of passing the consent agendas after private questions rather than public questions, and their complete lack of open discussion during broadcast meetings, the livestreaming and videos have been a welcome addition to transparency. The board seems to want to move through their meetings quickly (and while efficient, it is not instructive to the public). So livestreaming and videos have been the ideal access to those discussions. The videos are instructive to the public and allow observation even to those of us parents who work during most of their meetings and could not otherwise get to see them. Again, thanks to APS and the Board for a good budget but I would ask them to PLEASE livestream and make available the videos of those committee and other public meetings so the public can observe our leaders at work! If indeed you are getting transparent responses, perhaps a response will be forthcoming as to what the board intends to do to protect teachers against administrative retaliation by misuse of the evaluation instrument and the PDP process. Given that these were two tools used to create the climate of fear that lead to a decade’s worth of academic genocide, one would have thought this would be among the FIRST things the new supt. and board would have addressed. Certainly the new board and supt. doesn’t think something THAT ingrained in the corporate culture simply goes away without it being addressed? Does it not bother you that close to a year in, NOTHING (that I know of) has been publicly done to address this? When it comes to “Positive Behavior Supports” please don’t be fooled into thinking that a “reduction of discipline referrals” is “proof” that it works. More often than not, administrators get that “proof” by retaliating against teachers who write referrals for discipline. How can we be assured this won’t be the case once again in APS when administrative retaliation has NOT been addressed by the new supt. or board? Are there some teachers out there who can attest to the fact that this has even been DISCUSSED, much less acted upon?